This area will be updated periodically with more detailed analysis of historical references. Sarah Hale's husband was a Freemason, and when he died, the Freemasons supported her financially and helped her publish her first book. Later in her life, Sarah Hale helped fund the finishing of the Bunker Hill monument, ( http://en.wikipedia.org/wiki/Bunker_Hill_Monument ) which was built by Freemasons (look at the plaque at the base, the specific mason lodge is mentioned). 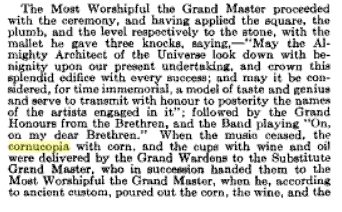 The link between the Freemason's and Thanksgiving is interesting, as the Freemasons mix paganism, Christianity and Judaism (possibly with other religions as well), and they use the cornucopia in their religious services. 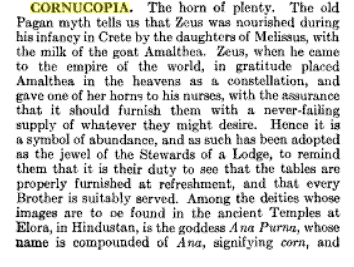 Here's a description from Page 243, of one of the services using the cornucopia, it has hints of biblical sounding language in it, mixed with paganism. She is considered a Saint, but more specifically an "Editor and Prophetic Witness, 1879" from Page 353 of the "Holy Women, Holy Men Celebrating the Saints"
She also has a feast day set for her on April 30th. 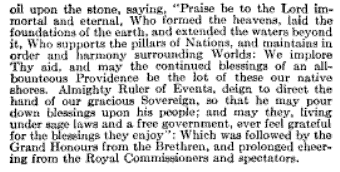 The role of the Puritans and the Church of England has been clearly established, but understanding Sarah Hale's historical connections with it and the Freemansons helps clarify why the cornucopia may have become a seamless part of the holiday's symbols. This may also explain why it's generally accepted as an either non-religious or even a Christian or Jewish symbol in our modern culture.